I’m never one to get political. It’s just not in my repertoire of things to discuss on a regular basis. However. Recent politics in Washington, the division of parties, the hate mongering, the lack of support for America’s leader just because it feeds their party rather than what might be better for the greater good, the wars abroad and the wars between our own political parties, a deficit that amounts to so many dollars there will soon not be a word for it (how about Bajuhzillions? ), the Clowns (Donald Trump), the frightening Vapids (Sarah Palin), our hideous health care system … all of that makes me feel deflated and I just want to go stare at the ocean and think about kittens. Yesterday, I was reminded of something. Reminded of Hope. Reminded that things can change if we work at it. Reminded that indeed America is an incredible place and I am, we are, part of it. 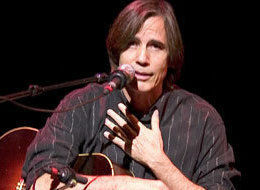 Yesterday, I sat in a lawn chair at a fund raiser for a local Congresswoman and listened up close and personal to Jackson Browne sing his song I AM A PATRIOT. Mr. No Nukes himself was a few feet away (as in less than 10 feet), singing it and meaning it. I looked over at Ms. Congresswoman and saw her bright blue eyes shining with hope and fearlessness as she faces her “toughest election year in recent history”. I looked up at the red, white, and blue balloons flying over the stage and felt happy. I looked out across the ocean that blew in a cool evening breeze across my new white summer dress and felt like the luckiest girl in the world. I heard JB singing from his heart and I got it. The word PATRIOT can sound like a derogatory word these days, especially among people of my generation and political bent. But I am a patriot and I was inspired again yesterday by a Congresswoman who is genuinely kind and by an honest-to-God troubador for change and hope. I’ve got no where else to go. This post sounds so serious upon re-reading it, but really it’s just one woman’s reacquaintance with hope on many levels. The power of speech and the power of music and the freedom of both are strong elements for change in any arena; be it personal or political. OH MY GOSH, MACGYVER – THE SUN IS OUT! We have been “suffering” the doldrums of June Gloom here in our seaside town. Waking every morning to grey skies does not make one want to spring out of bed filled with new ideas for one’s life or work. But, fingers crossed, that all may be behind us now. This morning I rolled out of bed, ready to decide which sweater I was going to wear to work while the rest of the world was putting on on their bikinis, grabbing innertubes and heading to the beach/pool/river/lake. Lucky suckers. But Holy Mother of Solstice, the sun was out and indeed the birds were singing. I LOVE summer (maybe because I was born in the deep winter and summer melts the ice in my veins). And it seems at last it has arrived. 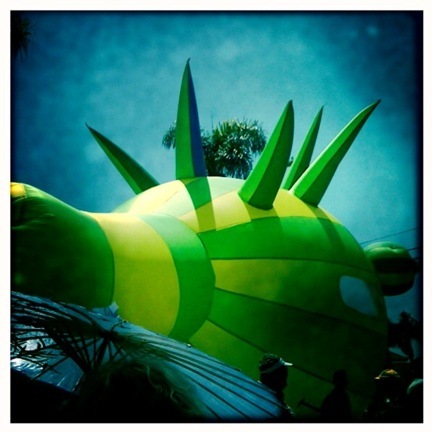 Yesterday was our town’s annual Summer Solstice Parade and it seems the whackadoodle pagan freak show brought the sun out for good. I also love parades. Especially when they are followed by family, friends, and sangria at my house (which is in post-parade-party central). Work is insanely busy this month, so blog posts have taken a back seat. 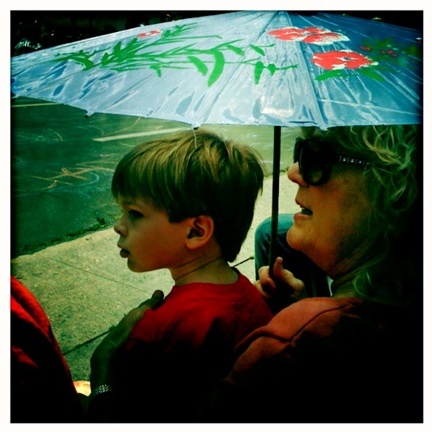 There is much to catch up on, but for now I leave you with this sweet photo of my mom and nephew enjoying the parade in the shade of a purple parasol. A good time was had by all. 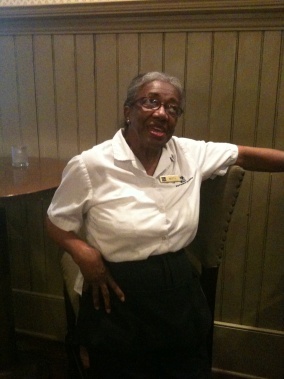 Ms. Betty and her gold name tag. I’ve referred to Ms. Betty on this blog once before. She came up in a post I wrote about the book THE HELP. ANYWAY. I got this email (with a picture of her!) 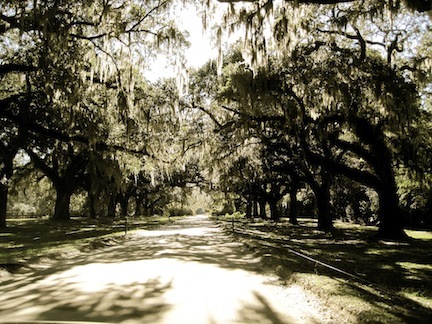 stating that the WENTWORTH MANSION in Charleston, South Carolina (hands down the most wonderful place I have EVER stayed in my whole history of hotel staying) had a special invitation for previous visitors. It was an invitation to Ms. Betty’s surprise 80th Birthday party on a sure-to-be-sticky-hot Sunday afternoon in July. The Wentworth Mansion recognized, as I did (and apparently hundreds of others have) the uniqueness that is Ms. Betty. Dayum. How wonderful is that? Regrettably, I cannot come to your birthday soireè. And I just KNOW you deserve to sit on a birthday throne and have your favorite cake and ice cream, sip a mint julep, and receive a whole lot of the sweet stuff you have given to others. I’m just one person, who met you only once, but Lady? You made an impression of goodness. You sang happy birthday to me that day and I wish I could sing it back to you next month. I’m glad the Wentworth Mansion appreciates you. Thank you again for your sweet singing. Enjoy every moment of your day and I wish more than anything and for many reasons that D and I could be right there with you. Miss Susan, the girl with the blue scarf. TWO YEARS AGO TODAY was a day of surprises; family on the front porch. A quiet moment of gratitude and love before the crowds descended. A day for an unexpected flowing red dress. A day of laughter in the kitchen. Angel food cake with strawberries soaked in sugar. Friend-made food. And more family. A day of party lights strung around the patio, umbrellas in drinks, punch and wine. A day of guitar music, more friends, more family, both old and new. And more guitar music. More. More love, more life. Ribbon wrapped presents, cards of caring, flowers, hugs, smiles relaxing into laughter, singing, candles blown out with a wish. A day of gifts received and given, some in boxes, some just words. A day of celebrating a supremely-special life. Two years ago today is a cherished memory; the kind of memory that will beckon like a warm light through a window on a cold, cold day and be there whenever I, or you, want to remember. And I do. This isn’t really a post. 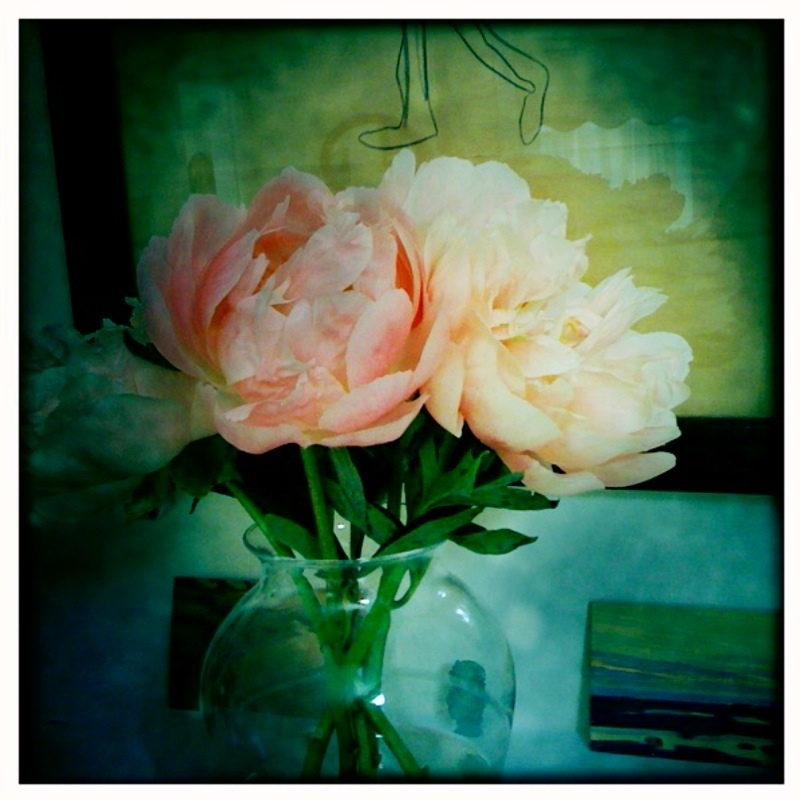 I just couldn’t look at my blog and see Justin Bieber’s face any more, so I am posting this photo of the full-blown peonies that are now on my mantle. They are gorgeous. Way more eye candy to this woman than the Biebs will ever be.